This is my Ukigumo tree which I’ve had in a container for four years. It’s such a beautiful tree, especially in spring with the fresh light colors. I like the way it weeps in this picture, heavy with the spring rains. It’s lovely. Is it a kind of acer? Yes, Acer palmatum, a Japanese Maple. It only grows 6-8 feet, perfect for a container. 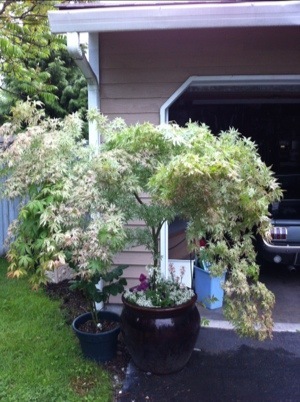 Do you have any Japanese Maples? I have a beautiful one in my garden, but sadly we lost one branch to a kind of fungus or virus… we acted quickly and this year it looks okay, just a bit deformed! This tree is beautiful. Where are you located – I wondered how it wintered. I live in Southern British Columbia where are winters are not bad but can have short bursts of harshness (cold temperatures, wind and snow). How does it fare in the winter months. We’re practically neighbors! I’m in the Seattle area and this tree doesn’t seem to have any winter issues, mine is in a container even. Sometimes the trouble comes in the summer if the variegated leaves are exposed to hot afternoon noon…sun scorch. I love Ukigumo, I think spring is it’s best season. Thanks for the info – I am off tomorow to find me a Ukigumo. I would imagine it didn’t mind all this horribly wet weather either!!! !